KGB security is happy to bring you the best in home and business security. Handling even the most difficult issues in property security, our professional team of handpicked experts are ready with all your security needs. We have always been ahead of the game in lock technology and in 1988 we jumped at the chance of integrating computer technology into security. Property owners will recognise the requirement of security for his or her property. It’s easy not to feel safe concerning your security in the south brisbane area being so close to the CBD. We are dedicated to creating economical, dependable recording devices which will meet anyone’s security requirements. We provide a good range of services from putting in controlled access points for card swipe technology and CCTV to the most effective physical security methods delivered and install in South Brisbane, offered all day, every day. With over twenty years of experience we have the know-how to help you with all of your security requirements in South Brisbane. Our company started out in 1987 with three founding members Kel, Brock Phillips, Geoff. Our first office was located in Greenbank but we soon moved a few times within Brisbane before finding our ideal location in 742 Beaudesert Rd Rocklea, in 2005. The main focus of the business was initially physical security methods and locksmith solutions however we noticed a need for change and soon moved into vaults and safes. During 2005 we were awarded the title of Chubb Safes Premium Dealership. 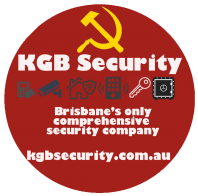 To meet the demand for electronic solutions in security the company formed an electrical division called KGB Security Electronics. We appointed John Lent to the electrical division who has 30 years of experience in security, he has been an asset to the company ever since. The new division head added more skills and knowledge to the company as a whole. We expanded into CCTV solutions and have been growing that part of our business. We are currently working on the creation of a single wireless unit access control system for larger remote sites in the South Brisbane and South East Queensland area. Our company is made up of committed team members that know the need for home security. Because we care about security ourselves we have a good idea of what people want and need in their own security solutions.